Being the foodie that I am, you better believe Thanksgiving is one of my absolute favorite holidays! I come from a family of AMAZING cooks, so when they all get together to celebrate, it is literally my favorite meal of the year. Stuffing, Turkey, Gravy, Mashed Potatoes, Sweet potatoes… just thinking of makes my mouth water. As I was brainstorming what to make for dinner the other day, I wanted a taste of Thanksgiving without all the work. Then I just started cooking and came up with this yummy dish. If you love the flavors of Thanksgiving, you are going to love this meal. 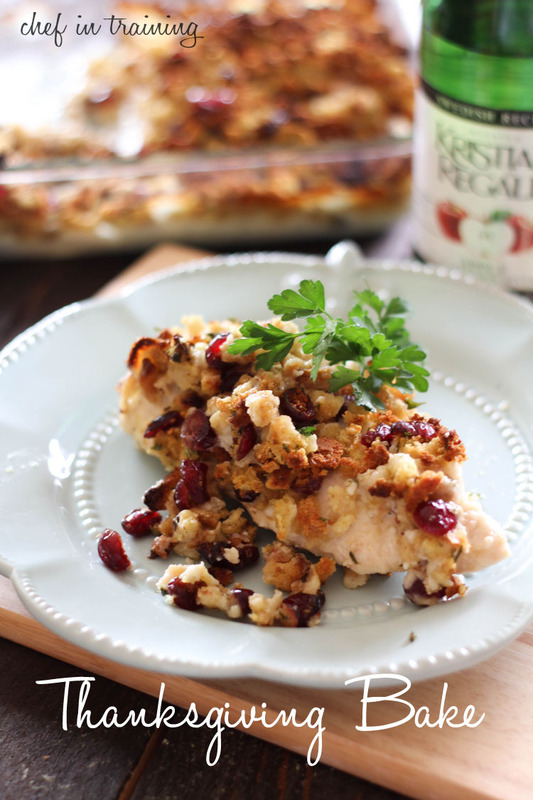 I think the Kristian Regale sparkling apple cider added such a nice flavor to this meal- and what I didn’t use in cooking, my hubby and I enjoyed drinking over dinner! MMM! It is the perfect time of year to enjoy Sparkling Cider and I for one not only enjoy drinking it, but cooking with it as well! Kristian Regale has a variety of delicious and unique flavors that are sure to make your holiday all the more special! All the yummy flavors of Thanksgiving wrapped up into one incredible dish! Place chicken breasts in a greased 9x13 baking dish. In a large sauce pan, melt butter over medium heat. Once butter is melted, stir in flour and stir to form roux. Let it cook together, while stirring, for about a minute. Slowly add milk a little at a time. Stir constantly until thickens. Once thickened, add onion powder and garlic salt and stir to combine. Pour over the top of chicken. In a medium bowl, combine dry stuffing mix and craisins. Add sparkling apple cider and water until stuffing has all be coated. Pour over the top of sauce. Bake at 375 for 30-40 minutes or until chicken is cooked through. This looks really good with flavors of the season, and it is creative, too! Yum! I'm allergic to milk. What can I substitute for milk in the thanksgiving bake recipe? I would use chicken stock. Browning the flour a little in the butter might make for a richer flavor if you do it that way, too. I made this tonight and used plain almond milk and dairy free margarine and it turned out really good. Definitely pinned to try this one soon! Love craisins, I could eat the whole bag ha! Oh, YUM! This reminds me of a cornbread dressing casserole w/chicken my mom has been making for years only this is healthier with less dressing and more chicken. I'm so making this! This looks incredibly delicious! I love anything with Craisins, and anything to do with Thanksgiving. My Momma's stuffing is one of my most favorite Thanksgiving/Christmas dishes! Oh man, this pregnant Momma can' t wait for Thanksgiving! This really looks interesting and sounds delicious. It looks easy enough for any night too. I shared this link with my FB followers today. Thanks! Do you think chicken broth instead of the apple cider would be okay? Thanks for a good one! I do a chicken & stuffing casserole where you make the stuffing according to package directions and then spoon it over the chicken and sauce (the sauce is cream of mushroom soup + white wine + garlic + thyme) and bake it covered in foil until the last 10-15 minutes. I would think chicken broth would work just fine for this one. I saw your Bubble Up Enchilada recipe and their was nutritional information added . . . do you normally not do this? This is only the second recipe at which I have looked. Just FYI, if you want nutritional information for any recipe, you can get recipe software like the old Mastercook program, where you plug in the ingredients and the number of servings and it gives you the nutritional information. I think there was a recipe site that let you do this as well, but I don't remember the name of it. Or it might have just let you multiply recipes. I know Mastercook did that, though. Other recipe programs probably do it as well. Made this for dinner tonight. Easy and delicious! I made this tonight and it was amazing. My husband and I loved it and it was really easy. I couldn't find sparkling apple cider so we just used regular cider and it was still delicious. I also added some salt and pepper on top to add a little more flavor. We will definitely be making this again!!! This is soooo good! Thank you for sharing! My kids and husband loved this meal. My 10 year was asking for it again the next day. I only had regular apple cider and it worked fine. Thanksgiving is my favorite food holiday too!! This looks awesome, I can't wait to make it! I made this recipe this week and it was fantastic! I followed the directions exactly. My kids liked it and my husband raved about it. He took it for leftovers and felt the need to text me and tell me how great it was....again. I didn't know how to share the recipe via your website, but I was able to share it from Pinterest. Several of my friends requested the recipe after I posted it. They don't have Pinterest so I sent them the link to your website. Thanks! It is definitely a "Keeper"! Made this tonight. LOVED it! I'll take this over a Thanksgiving turkey ANY day!! I can not get the recipe to show, any chance someone can share it with me please? I used Brummel and Brown margarine instead of butter and the roux didn't thicken much. What did I do wrong? Thanks. Thanks for making my Thanksgiving dinner preparation so simple for my small gathering of four adults and one child! We all enjoyed this delicious recipe, and I appreciated how easy it was to make!